I've never been successful at growing carrots so I always purchase them. We bought a huge bag of organic carrots a while ago. Some of them we use in our smoothies, some in our dishes and then my husband asked me for a soup made with the carrots. 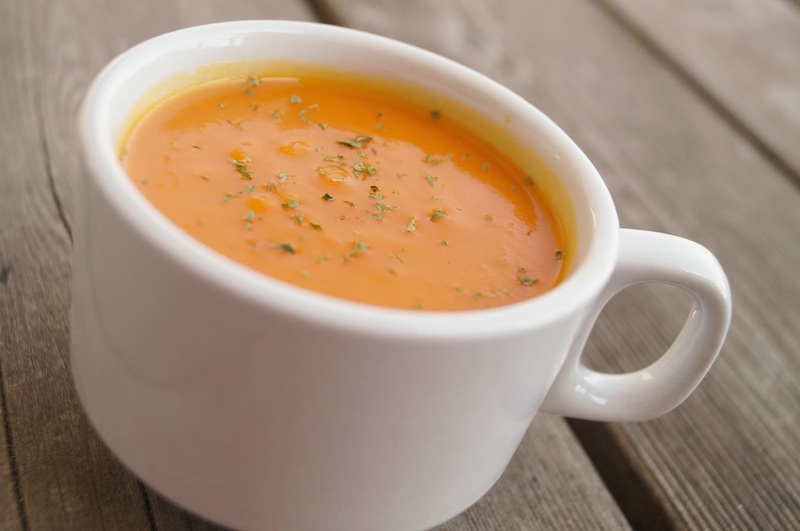 This soup is creamy and easy to make. The ingredients are easy to find. It makes a great side dish, adding a grilled cheese sandwich to round it out or serve it with some grilled chicken. A fancy blender will give you a smoother soup but you can still fine with an immersion blender, food processor or regular style blender. Check out my tips at the bottom for your type of appliance. 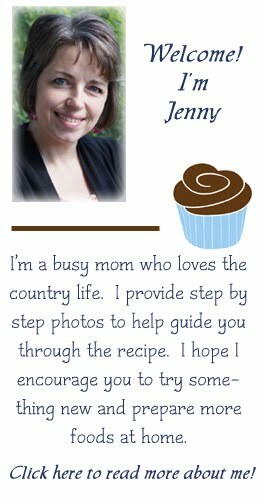 Some of you have met my family through my Facebook page or perhaps you read my About Me page. 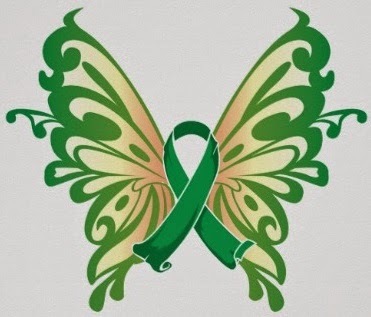 My beautiful daughter has cerebral palsy due to a battle with meningitis when when she was just 4-1/2 months old. She is 18 years old now. Yes, always smiling and always happy! I love my Quick Pizza Dough recipe but sometimes I don't want to heat up the kitchen with the oven for just me. 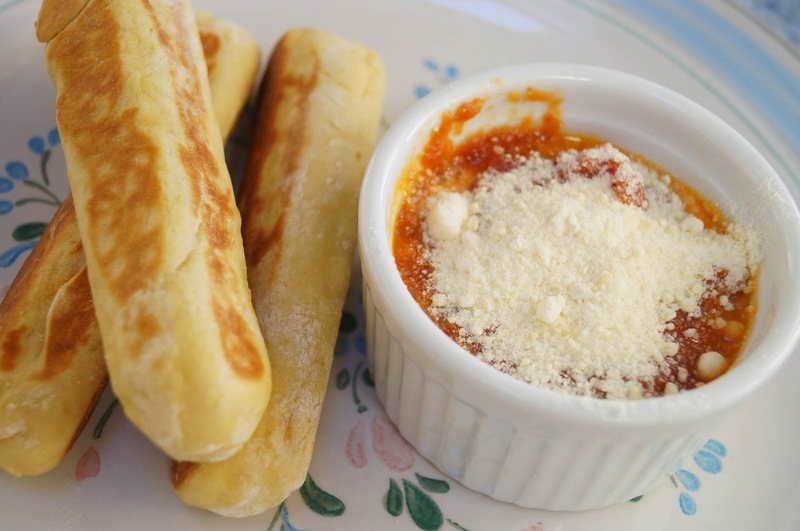 One day I flattened the dough like a pizza and cooked it in my pan so I could dip it in the Roasted Marinara. Then I realized I was missing out on the cheese. 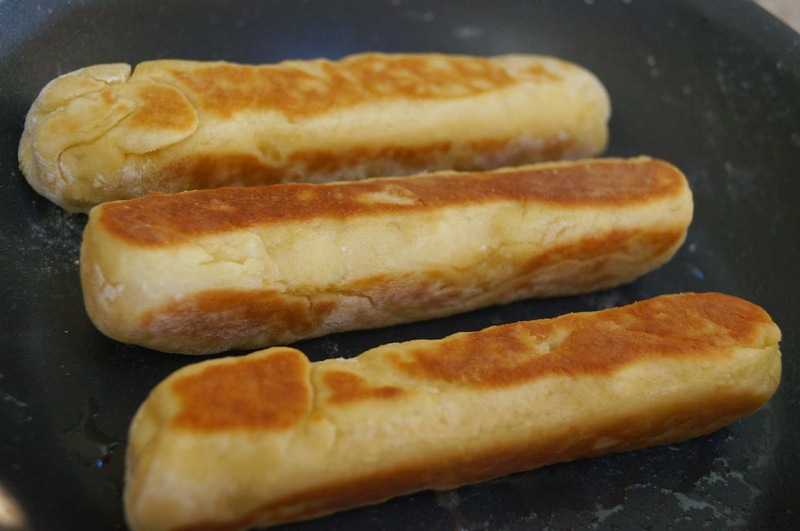 I decided to wrap a cheese stick up in the dough and then cook the dough. Yum! It's ooey gooey! Quick and easy to make! Add yeast and sugar to water. Let set for 5 minutes. Add olive oil, salt, and flour. Stir until completely mixed. It is OK if it is a little wet. You are going to add to a floured surface and knead. This will add flour and help complete your dough. It should take you less than 5 minutes to get a nice smooth ball. Cover with a towel and set aside for 15 minutes to rest/rise. Divide dough into 6 pieces. Roll out into a rectangle that is large enough to cover your cheese stick. 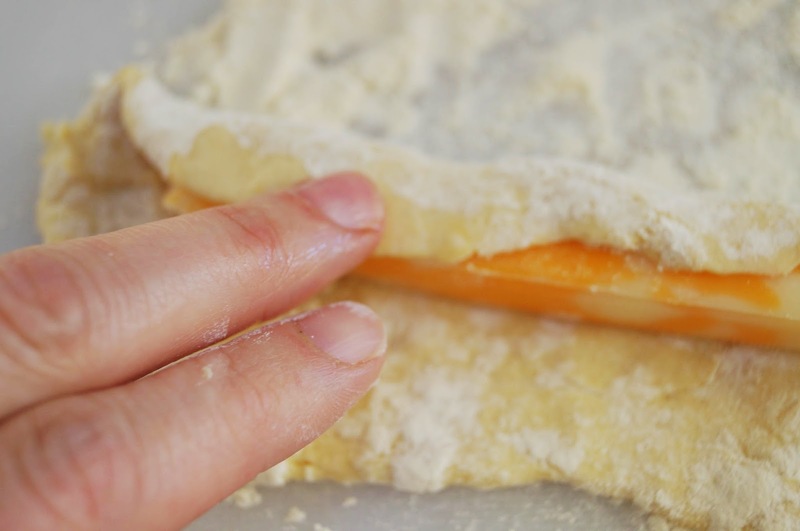 Dampen the edge of the dough so when you fold over last edge it sticks. Do the same on the end. 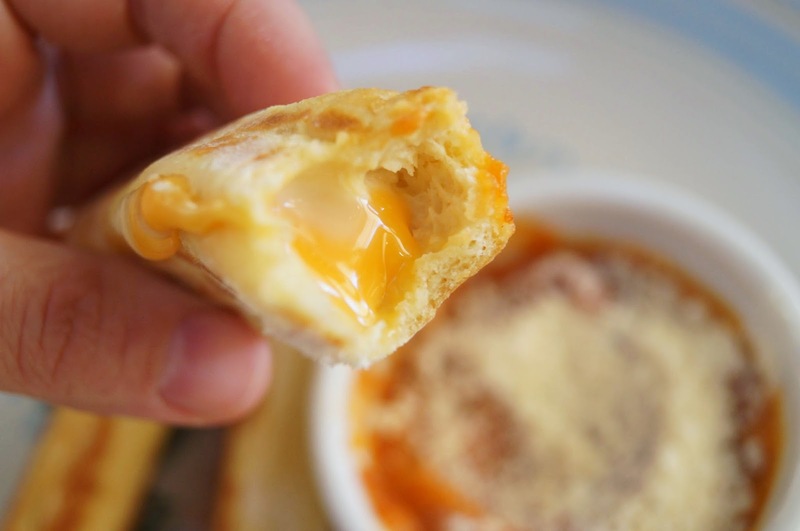 I lightly roll it all to be sure the are not holes for the cheese to seep out of as it melts. Lightly oil a non-stick pan and heat to medium. 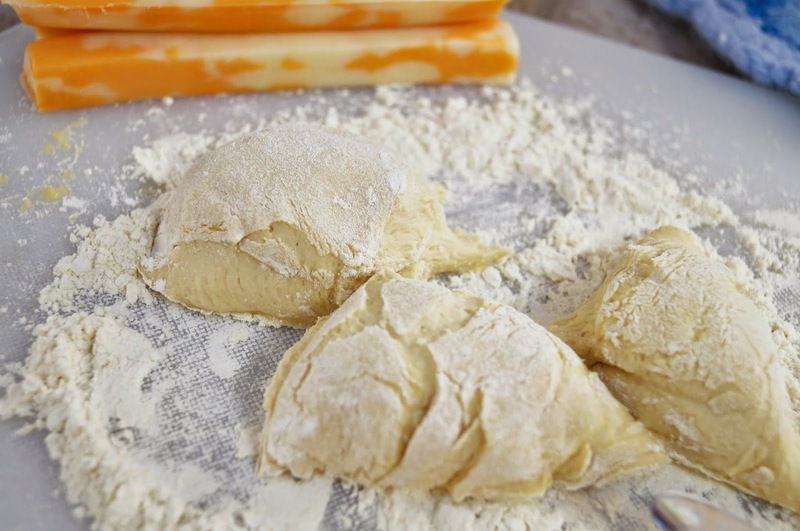 Add dough wrapped cheese to pan and cook until light brown. Flip each side and continue to brown/cook the dough. 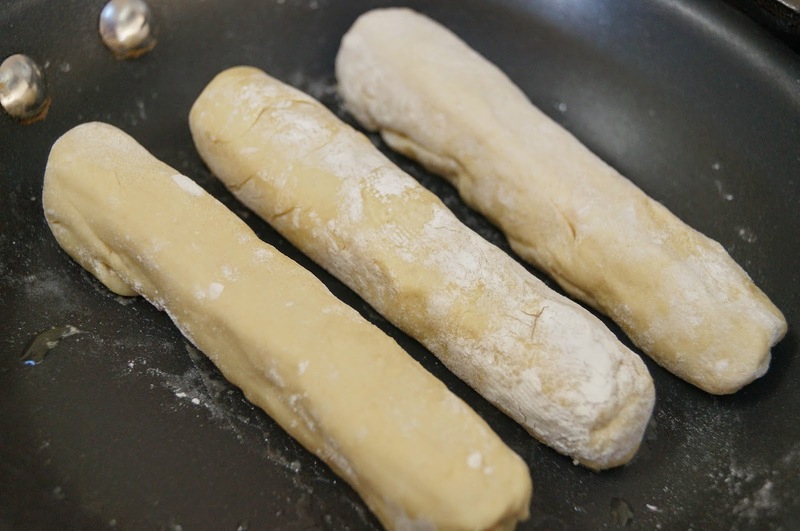 If you want all edges brown you will need to gently hold the bread stick and hold the part of the dough you want browned to the pan. I have learned that if you go too long they can leak but not as easily as when I did them in the oven. Remove from pan and allow to cool for just a bit while you warm up your marinara sauce. I topped my sauce with Parmesan for extra cheesy flavor! These are great to send in lunches too. Check out that melty cheese! I think next time I will make extra and freeze some.